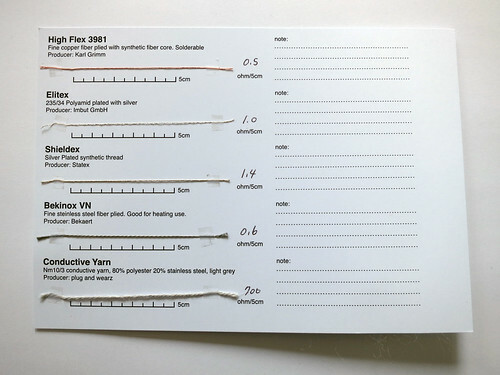 collect samples and make a page for your swatch book. 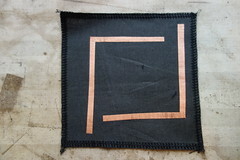 This is a Lithium atom. 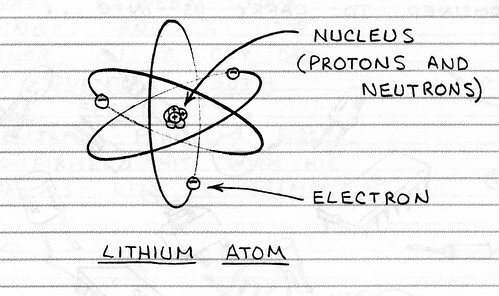 Lithium atoms have 3 electrons that encircle a nucleus of 3 protons and 4 neutrons. 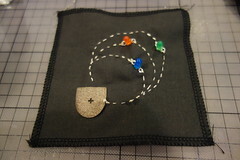 Normally an atom has an equal number of electrons and protons. 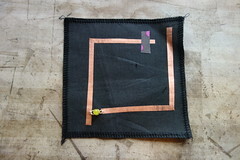 The charges cancel to give the atom no net electrical charge. 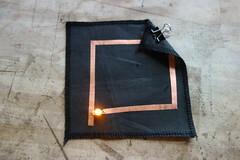 It is possible to dislodge one or more electrons from most atoms. 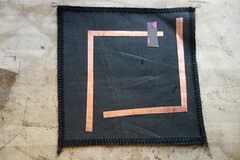 This causes the atom to have a net positive charge. 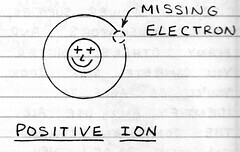 It is then called a positive ion. 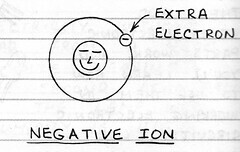 If a stray electron combines with a normal atom, the atom has a net negative cahrge and is called a negative ion. 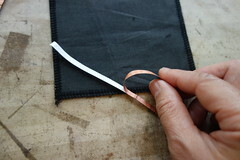 Free electrons can move at high speed through metals, cases and a vacuum. 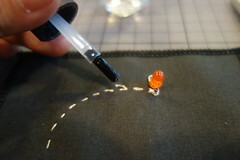 Or they can rest on a surface. 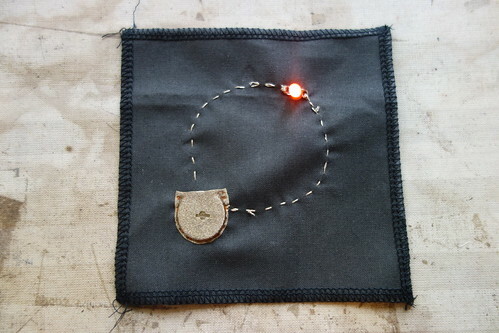 A stream of moving electrons is called an electrical current. 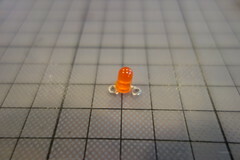 There are two things we have to take care when using LED. 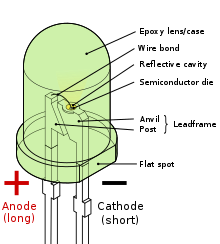 – LED has polarity. 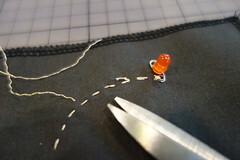 Make sure to connect LED in correct direction. 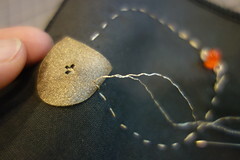 You can tell the direction as the positive side usually has a longer leg, or a smaller triangle lead in the epoxy lens. 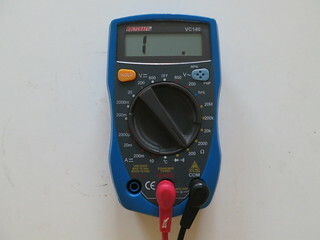 How much voltage and current does LEDs require to light up? 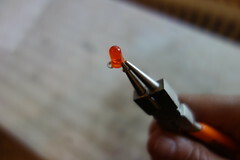 It depends on the LED and you will need to check its datasheet to know exact specification. 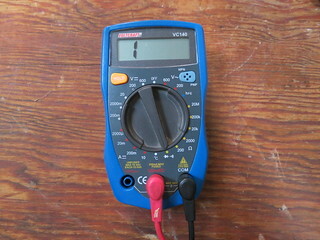 The voltage you need is called “(forward) voltage drop” and the current required is called “forward current”. 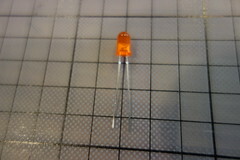 Most of the normal (not super bright) LEDs light up somewhere around 2-2.5v and require 20-30mA. 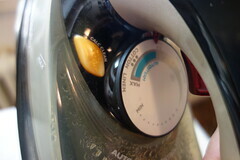 – You will need to limit the current to suitable range. 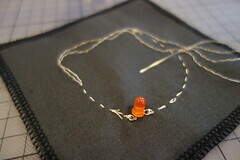 When circuit is completed and current flows through the LED, it will light up. 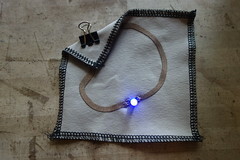 we can create this circuit using conductive textile materials. 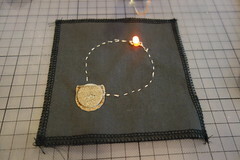 Prepare the LEDs to sew-able shape. 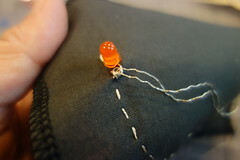 knot the end of the thread so it does not slip off. 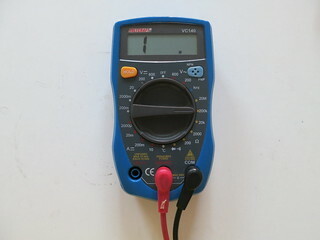 Start with “-” connection to the battery. 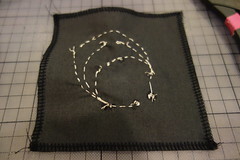 This will be placed on the middle of the battery holder. 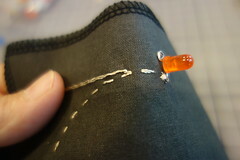 sew through the LED curled leg like button holes and knot the end. 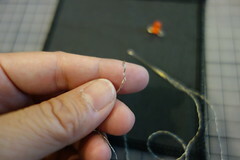 Make sure to cut the thread. 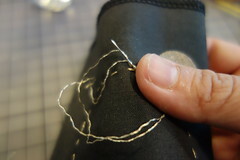 You can apply a bit of nail polish to prevent the knot from fraying. 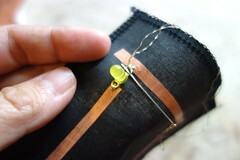 start with the other side of LED and continue to the battery holder. 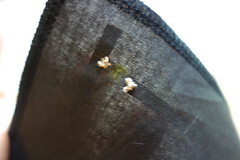 sew the edge of the battery holder few times. 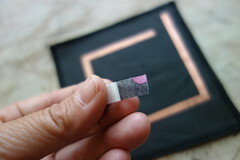 this will be “+” side of the battery connection. 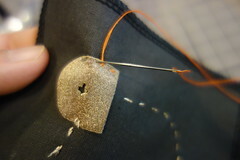 Sew around the battery holder’s edge with normal thread to place the battery holder onto the base fabric. 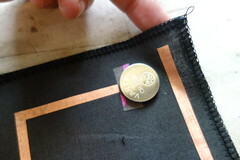 When you place the battery in battery holder (make sure the + is facing the + mark side of the pocket) the LED lights up. 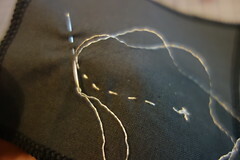 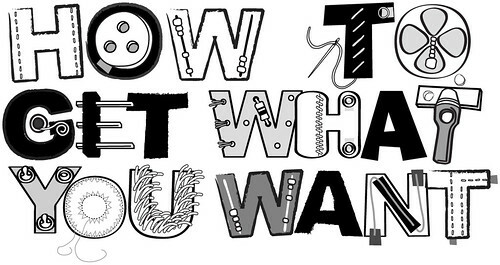 You can experiment with other types of stitches to enhance your embroidered circuit. 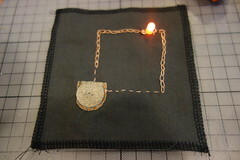 You can add several of LEDs in parallel to the battery. 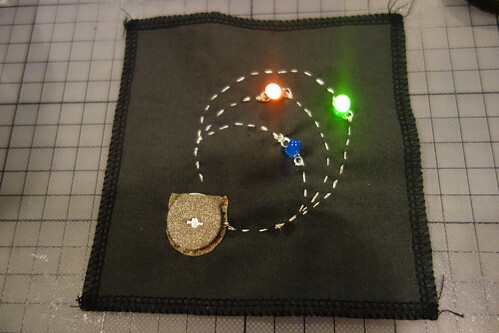 Note that in this example, only the Orange and Green LED is lighting up. 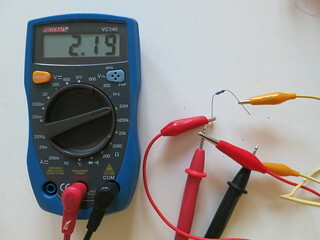 This is because voltage drop of Blue LED is higher and as it is connected without “current limiting resister” for each LEDs, it does not get enough voltage. 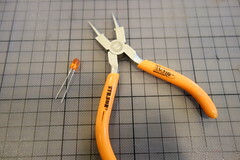 When mixing up different colors of LED in one circuit, make sure that you add current limiting resister (it can be resistive textile material), or chose similar voltage drop LEDs. 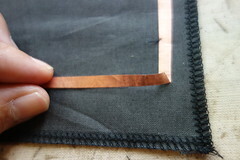 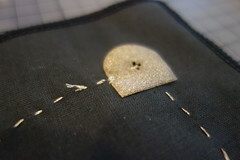 Cut conductive fabric that has fusible interfacing on one side. 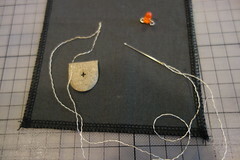 peel off the backing paper and place it on base fabric. 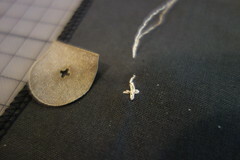 Make sure the iron is set to “2”. 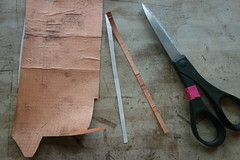 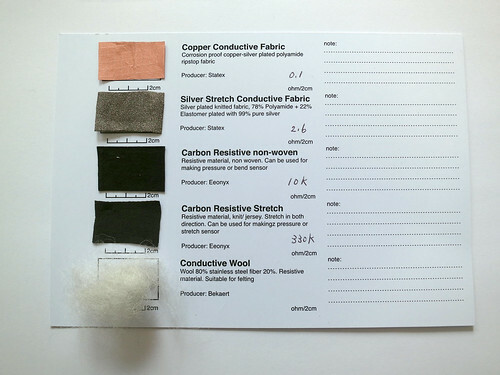 Especially the silver stretch conductive fabric does not take higher heat. 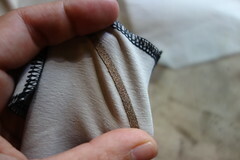 Edges can be folded togheter. 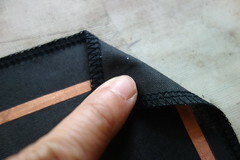 cover a part of the “-” side of battery connection with non-conducitve fabric. One can make this circuit with stretch conductive fabric. 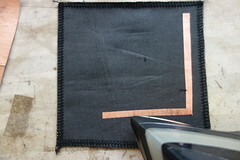 Then the whole circuit can be stretched, but the electrical function will remain the same.